Dr. David Schor treats sleep apnea for his Lawrenceville dentistry patients to reduce fatigue and irritability while also reducing the chance of heart attack and diabetes. Lawrenceville, NJ – For Sleep Apnea Awareness Day, Dr. David Schor answered some commonly asked questions on his New Jersey dentistry practice’s blog: “Sleep Apnea Awareness Day.” The patients of Imagine Advanced Dental Arts frequently come to Dr. Schor about sleep apnea with questions that range from common symptoms and diagnosis techniques to treatment options. 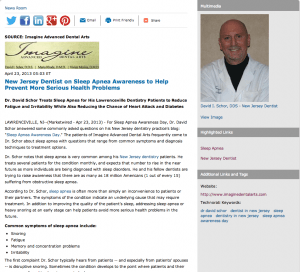 Dr. Schor notes that sleep apnea is very common among his New Jersey dentistry patients. He treats several patients for the condition monthly, and expects that number to rise in the near future as more individuals are being diagnosed with sleep disorders. He and his fellow dentists are trying to raise awareness that there are as many as 18 million Americans (1 out of every 15) suffering from obstructive sleep apnea. According to Dr. Schor, sleep apnea is often more than simply an inconvenience to patients or their partners. The symptoms of the condition indicate an underlying cause that may require treatment. In addition to improving the quality of the patient’s sleep, addressing sleep apnea or heavy snoring at an early stage can help patients avoid more serious health problems in the future. The first complaint Dr. Schor typically hears from patients – and especially from patients’ spouses – is disruptive snoring. Sometimes the condition develops to the point where patients and their spouses are forced to sleep in separate bedrooms. The New Jersey dentist stresses that only a licensed physician is able to diagnose a patient suffering from obstructive sleep apnea and Imagine Advanced Dental Arts only sees patients on a referral basis. He provides all of his referred patients with Sleep Apnea Risk Evaluation Screening Test questionnaires to outline their health records, sleep habits, medical conditions, medications, daytime drowsiness levels, and the impact snoring has on one’s daily life. In some cases, these patients will partake in an overnight sleep study to determine the severity of the patient’s condition. Dr. Schor adds that sleep apnea is a good example of how oral health and the health of the whole patient are interrelated. His goal is to encourage proper oral health that will lead to a complete, happy, and wholly healthy patient. Dr. David Schor serves as a Fellow of the Academy of General Dentistry. He is one of only 350 doctors worldwide who is board-certified by the American Board of Orofacial Pain and is chairman of the Mercer Dental Society Peer Review Board. Dr. Schor is available for an interview upon request.